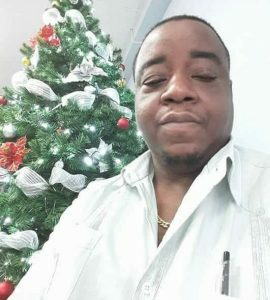 A 48-year old man, who was a well-known Legal Clerk, was found dead at his residence at Kuru Kururu, Soesdyke Highway, sources said. The body of Gregory “Wayne” Frank was found face down with an apparent wound to his head. He was the Legal Clerk to Attorney-at-Law, Abiola Wong-Inniss. A source told Demerara Waves Online News that he last saw Frank Tuesday raking his yard. Residents believed that he was killed Tuesday night. After he did not answer numerous phone calls relatives went to the house and found his body on Thursday morning. The door was ajar and a drill was found in the yard. Residents nearby believed that the incident was a robbery-murder. Two television sets were missing and the house at 689 Kuru Kururu was ransacked. The Guyana Police Force later said in a statement that Frank’s body was found in his living room at about 4:30 AM and items were stolen. “The back door was found opened, the entire house ransacked and valuables which the deceased was known to have possessed, are missing. The scene is currently being processed and no arrests have at this time, been made”. There have been several home invasions by armed bandits in the Kuru Kuru area in recent weeks. 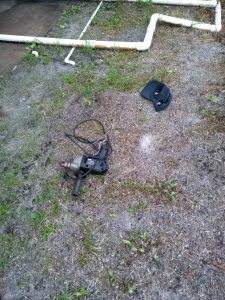 The drill and a cap that were found in the yard. Investigators believed the drill was used to gain entry to the house where George Frank lived.